In a coup for NSW food lovers, the top three prizes at the prestigious 2016 Chef’s Table Awards all went to regional clubs at last night’s gala ceremony at The Epping Club. It’s the first time that regional clubs have so authoritatively stamped their fine dining credentials on the annual Awards, with two Newcastle clubs taking out Gold and Silver while the Bronze Award is making its way to Dubbo. 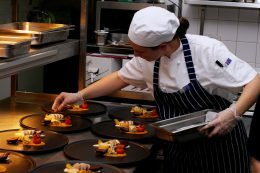 The competition pits the 40 best club chefs from across NSW against each other in a bid to design and create a delicious three-course meal for 18 people, while sticking to a budget of $22 a head. Wests Mayfield Head Chef Dylan Browne and Sous Chef Renee Henderson took out the Gold Award for their three course culinary masterpiece, which featured wild rabbit cannelloni and a yellow monochrome dessert. Fellow Newcastle club Wests New Lambton narrowly missed out on the top spot with Head Chef Lesley Taylor and Sous Chef Daniel Wijekoon taking home Silver for their delectable dishes including an octopus terrine with lemon aspen and pineapple curry, and their ‘Ziggy Stardust’ dessert. The Bronze Award went to Executive Head Chef Robert Leonard and Apprentice Chef Brooke Stewart at Dubbo RSL Memorial Club for their phenomenal three course menu, featuring potato gnocchi and emu pastrami and sous vide rabbit. ClubsNSW CEO Anthony Ball said that the standard of this year’s Chef’s Table competition was at an all-time high, sizzling with good food and great talent. 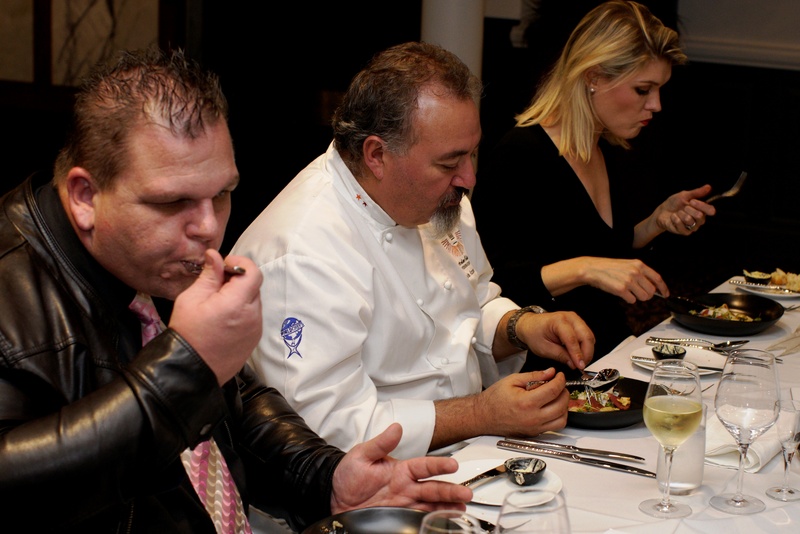 “As the saying goes, “the proof is in the pudding”, and the club industry is fortunate to have so many gifted chefs who produce thousands of quality meals to wow any tastebud,” he said. “The skills, thrills, tricks and trends we’ve seen on show amongst our 2016 finalists shows why clubs are offering food and dining choices to members and patrons that even some of Sydney’s best restaurants would envy. 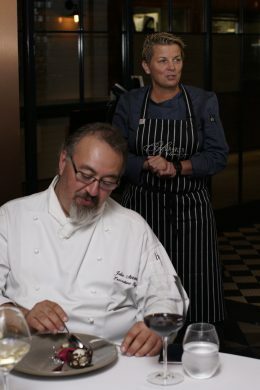 Chairman of Judges Julio Azzarello, who judged the competition alongside Executive Chef Adam Moore and Masterchef Season 2 Contestant Courtney Roulston, said the highlight for him was the thoughtful precision and deliberate nature of the meals. “The winning teams used locally grown, harvested and procured commodities that all came with a back story, from the wild caught rabbit to the locally smoked Emu,” he said. “These meals showed a strong sense of community as well as a deep understanding of cooking techniques and flavour combinations. Also at the Awards night, Beth Dobbins from Oatlands Golf Club was named the 2016 Apprentice of the Year. Beth was recognised for her stellar performance and incredible skill in preparing a delectable three-course masterpiece alongside Head Chef Paul Molan. Gold: A trip to the US for the National Restaurant Association Show and the Beverage Alcohol for Restaurants (BAR) event in Chicago plus visits to New York and Las Vegas (mid-May 2017). Proudly sponsored by CCM Travel. Silver: A luxury escape for four to Mudgee’s wine country with two night’s accommodation at Perry Street Hotel, a wine tasting at Robert Oatley Vineyards, Robert Oatley wines, lunch at Wild Oats Cafe, and dinner at Pipeclay Pumphouse. Proudly sponsored by ClubsNSW. Bronze: A trip to Melbourne with entry to the Fine Food Australia Show including a night’s twin share accommodation at a 4-Star hotel and breakfast. Proudly sponsored by CCM Travel. Apprentice Award: Direct entry into the 2017 Fonterra Proud to be a Chef mentoring program and the opportunity to win an international culinary scholarship. Proudly sponsored by Fonterra Foodservice. The winner will also receive a cash prize, valued at $2,500. Proudly sponsored by Hospitality Training Network (HTN). Authored by ClubsNSW Media Release.